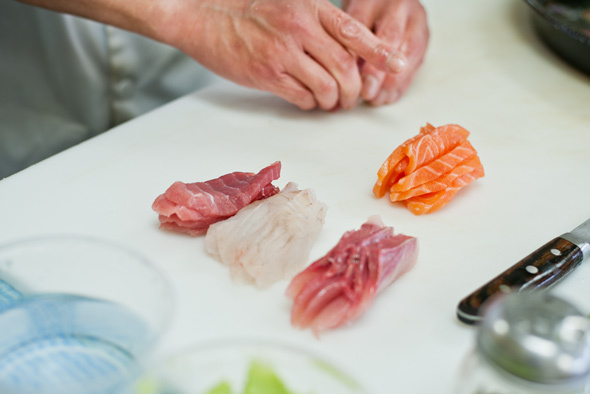 Sushi Marche's chef John Lee is, unsurprisingly, a stickler for fresh fish. So much so that the Montreal-raised chef admits to discarding anything that doesn't meet his standards. 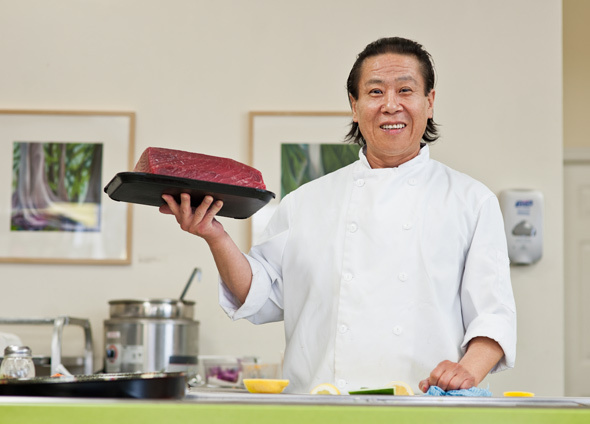 Preserving the quality of his fare is one of the many principles he's learned from training under top sushi chefs, including the Iron Chef himself. We sat down at his Leaside location to talk about what types of fish he will not serve his customers, reversing the AYCE trend, and building a Sushi Marche empire. Yes, I started when I was fourteen so I started off when I was pretty young. I was a kitchen helper and things like that. Then at the age of 20, I had the opportunity in Montreal to learn how to make sushi at a place called Sushi Bar. I was very fortunate with my first sushi chef; he really went out of his way in cooking classes and gave me an A-Z on how to cook the rice and how to wash it--that's how I started. Even now after 25 years, I still use his recipes all the way through. And I got as far as working in Philadelphia for (Masaharu) Morimoto, and even now I still use his original recipes. In this business it's very hard to find someone who will give you that and be an open book. I think because of that I was able to go quite far in my career. In your opinion, what's the main difference between Sushi Marche and so-called "cheap sushi" restaurants like Sushi on Bloor. It's the freshness and where we buy it. I think most chefs pay $13.95 and I pay like $17-$18. A lot of my fish, including yellowtail, come from Japan so it's really high-end quality. Even with salmon you can have different grades. What is different about the quality or type of fish offered that diners should be aware of? If I'm not going to eat it, I won't serve it to others. Now, it's really hard to get good fish and good tuna because of the water situation and all that, and a lot of times I have to throw it out. If it's not at that quality standard, I'll throw it out--honestly, even $200-$300 worth of fish. I'd rather do that and serve good quality, because once someone is disappointed, they won't come back. 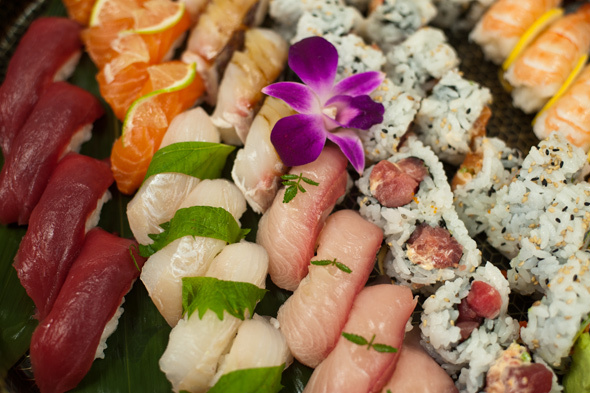 With sushi, it's all about the freshness; if you can't serve the best fish, then it's quite tough. I have a hard time understanding all-you-can-eat sushi. It's not that they have bad fish, it's just that they serve very different fish like salmon, izumi-dai and surf clam ... that's about it. Many Toronto sushi restaurants have tilapia on the menu (or use it instead of red snapper). Would you ever serve raw tilapia? No. I would never use izumi-dai because for me, it's not sushi grade. Butter fish, too--I really don't understand it. I don't think it's a sushi fish, and if you cook it, it just dissolves, so what's the point? I think with food, what you eat is what you are. I can tell the character and personality of a person by what they order, and what kind of fish they like. It tells me a bit about the person. What are the challenges or compromises you need to make operating a sushi restaurant so far from where the fish are caught? Before we had to compromise, but not any more. With the airlines, if I want to by something from New York, I can have fish here within 24 hours so it's very easy. It got a lot easier, but it's just paying the price for it now. Where do you source your fish from? What days of the week do you get fresh fish? It's hard to say. We have different fish coming in on different days and different sources. I get a lot of stuff from Japan, so we get in on Wednesdays and Saturdays. We have agents who purchase stock for us, and they have outlets in Vancouver. We have to order 5 days in advance, and then they bring it in. You now have two Sushi Marche locations in Toronto. Any plans for further expansion? I'd like to expand more, as much as I can. That was my original idea--to open as many Sushi Marches as possible and for young chefs to operate on their own. I don't know when, but I'd like to expand as much as I can. 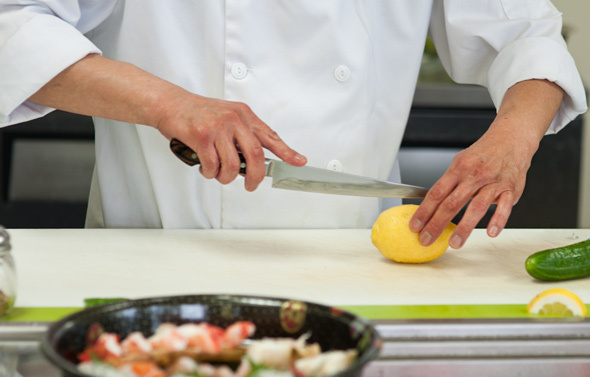 If you had to take someone on a culinary tour of Japanese restaurants in Toronto, where would you take them? I like Sushi Kaji very much. I think it's very well-balanced, and he's been here about 30-35 years, so he's a great chef. I think he's one of the top chefs in Canada or in North America. I love eating there. Right now Guu is popular and I like it, but Fin is also nice.